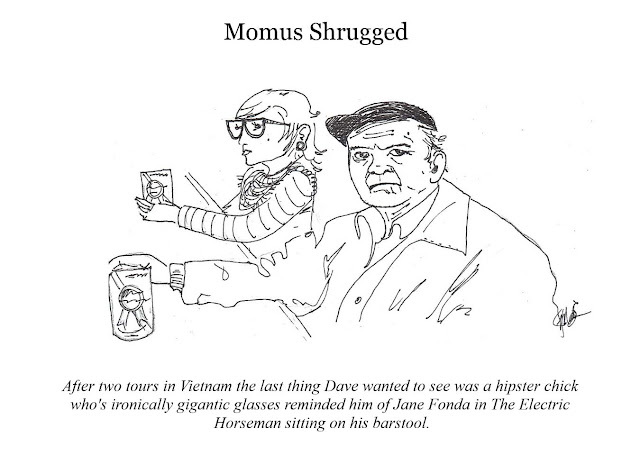 Momus is the Greek god of satire, mockery, scoffing, and criticism. The original hater. As such, it is no surprise he is also the god of poets and writers. On Mount Olympus, home of the Greek Gods, Momus performed much the same role as the Fool did in Shakespeare's plays, namely being the one person allowed to be critical of those in power without suffering the consequences. Of course The Fool's, and Momus' immunity was not absolute. Some criticisms were more well received than others, and there were always days when it would have better to keep one's mouth shut. But mythical manifestations of the human impulse to speak truth to power are sprinkled throughout the history of human literature for the simple reason that there always exists this desire to say what things really are, not what we are being told they are. This is the first panel of Zombie Logic Press' newest webcomic, Momus Shrugged, inked by artist Jenny Mathews of Tiny Drawings, and me, of, well, of this blog.